Easy to use QRH using arrows instead of turning pages to locate steps. Tabs make it easy to get to sections quickly. 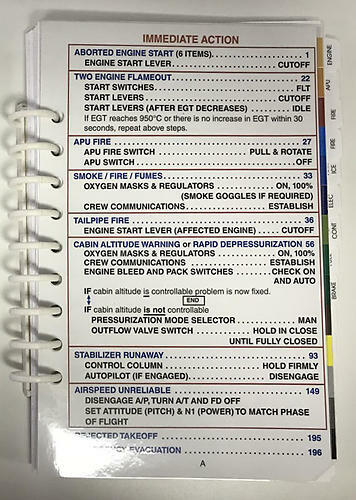 This QRH is meant to be used as a study tool, not to be used in the airplane. If you are a current 737 pilot you should be using your carrier's QRH. Excellent tool for training and for use in a simulator. Goes in depth explaining why steps are made, and has more procedures than the factory QRH.